Died: 13th October 1915; age 21; KiA. 1901 29, Regent Street, Ipswich. Frederick Adams, 42, a Fish Carman, born Holton, Suffolk. Mary Kate Adams (nee Ward), 32, born Hadleigh, Suffolk. Ellen Kate Adams, 13, born Ipswich. Frederick Adams, 11, born Ipswich. Harry Adams, 10, born Ipswich. Edmund Adams, 5, born Ipswich. Maud Adams, 4, born Ipswich. George Adams, 2, born Ipswich. 1911 9, Side Street, Ipswich. Robert was 17, a Carmen – Mineral Water – Mineral Water Manufacturer. He was living with his parents & siblings. Frederick, 53, a Fish Carman – Fish Merchant. Harry, 20, a Carman – Oil Trade – American Oil Cake. Edmund, 15, a Skin Cleaner – Sausage Skin Manufacturer. Reginald James Adams, 9, born Ipswich. Kathleen May Adams, 5, born Ipswich. Sidney Adams, 4, born Ipswich. Leslie Adams, 2 months, born Ipswich. Robert is remembered on St Mary at Stoke Church Ipswich War Memorial. 14:00hrs 13th October following an intense two hour shelling by the British on the Quarries the 7th were tasked with taking the 2 German trench system called the Hairpin. “B” company commanded by Major Currey pushed across open ground under a smoke screen, this lifted giving away the advance coming under heavy machine gun fire stalling the advance with 75 casualties including the Major a former Boar war veteran. “A”company lead by Captain C.A Cobbold and “D” company on the opposite flanks with the 7th Norfolk regiment bombed the German line under sustained mortar and machine gun fire being held up for some time by the German bombing parties (hand grenades) eventually a phone line was connected where contact was made with headquarters, the German mortar positions were then knocked out by the British heavy guns. 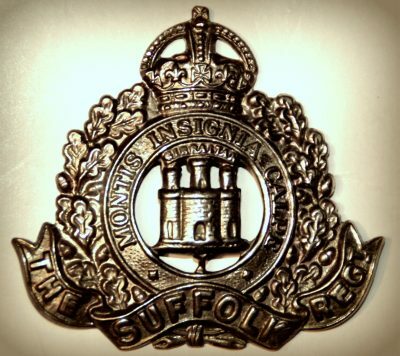 The Battalion consolidated the new position handing over to the 9th Essex regiment that night. The Battalion sustained over 150 casualties.